NES Inversion (1.4) in 05:18.91 by MESHUGGAH & jhztfs. A boy named Satoshi suffers from a unique type of color blindness — he can only see in black and white. However, he also has a special ability to turn solid objects intangible and vice versa! But despite the amazing power he holds, Satoshi only wants to see like a normal boy. He seeks out an answer to his vision problem in a mystical manor called the Denine Devil Mansion, where he meets a scientist who offers him a game. If Satoshi wins, he might gain the ability to see in color. With that goal in mind, Satoshi accepts the offer and begins the Inversion game. 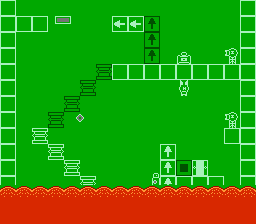 In each level, Satoshi must collect all of the keys to open the door to the next map. He can use his special ability to change the solidity of all objects in the level and reveal solutions to the game's many puzzles. Springs, moving platforms, vertical conveyor belts and levers can also be used to his advantage. In this run, MESHUGGAH & jhztfs use a few tricks and a lot of precise movement to help Satoshi beat the game in record time. This run is 5.94 seconds faster than the previous version by MESHUGGAH.